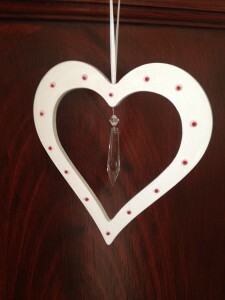 Home / STORE / Hearts / Crystal Drop Heart. These lovely hearts are decorated with ruby beads, from the centre of the heart hangs a crystal drop. 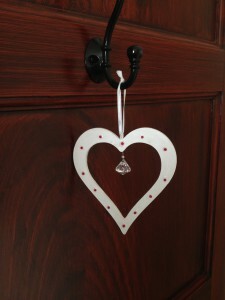 The heart hangs on white satin ribbon. They come in two sizes approximately 13cm and 18cm.